As an hors d’oeuvre enthusiast and overall lover of bite-sized foods… I knew my contest entry had to be an appetizer. 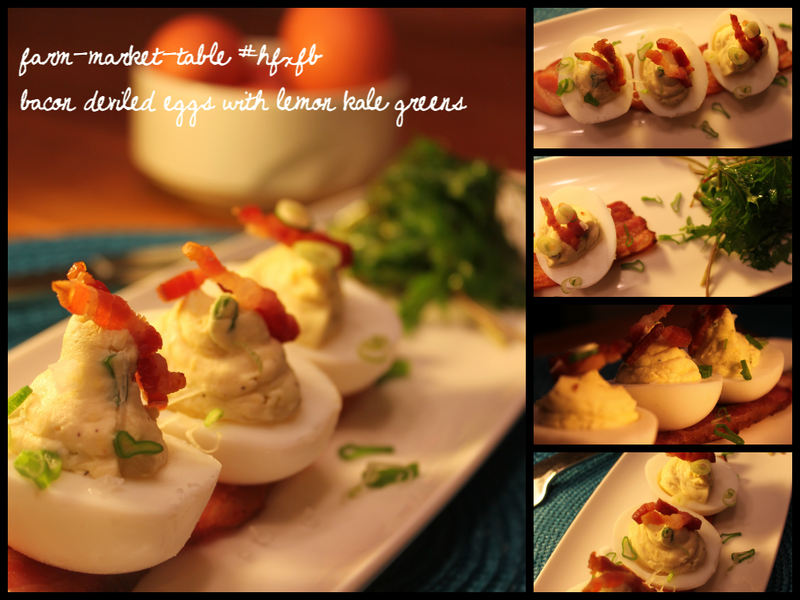 I was inspired and pleasantly surprised during my recent trip to Chicago – deviled eggs are on a comeback. Creative and local ingredients are inspiring this classic housewife cocktail party snack to be all that it can be. And guess what? The possibilities are endless. So how about a Halifax Seaport Farmers’ Market deviled egg? That is what my bacon deviled egg with green onion and parmesran cheese represents – local flavours, available at the market, elevating this traditional hors d’oeuvre to the next level. Cook the bacon bits in a frying pan until very crispy, reserve the bacon fat. Carefully peel, then slice the hardboiled eggs lengthwise. Gently remove the yolks and set aside in a small mixing bowl. Set aside the hollow egg white halves on a plate. In the mixing bowl, with the yolks, add about two tablespoons of the reserved bacon fat and 1/4 cup of Greek yogurt. Salt and pepper to taste. Mix up with a fork until the consistency is smooth with little to no chunks of yolk (add more bacon fat if needed). Add half of the of freshly sliced green onion, and 1/4 cup of very finely grated parmesran cheese (as finely as you can grate it) and gently mix a bit more. Take a sturdy ziplock bag, cut a hole about the size of your pinky in one bottom corner. Fill carefully with the egg mixture – this will be your piping bag. Pipe the mixture into the cooked egg white halves. Plate as desired (on top of a slice of bacon looks pretty cool), leaving room for greens on the plate. Top each egg with a couple of the crispy bacon bits, two or three flakes of sea salt, and sprinkle more sliced green onion over top. For the lemon-dressed kale greens. Just wash the greens, dry them, season with salt and pepper. Then dress with a dash of olive oil, and a generous squeeze of lemon juice – toss. Each bite of deviled egg should have greens with it – the acidity of fresh lemon matches the fattiness of the deviled egg perfectly. This isn’t a restaurant review. This is a brief recount of my experience at the 2 Doors Down soft opening weekend; we went on Saturday evening (the second night of operation). 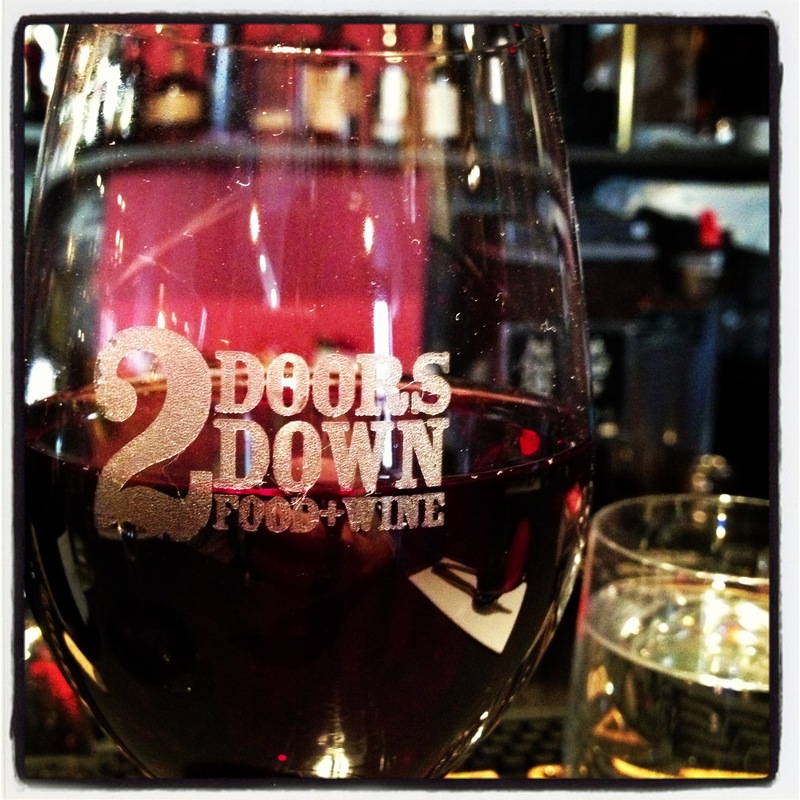 Not that I would have expected anything less, but everything they’re doing at 2 Doors Down is exactly as it should be. It’s the ideal addition to downtown Halifax. We were ecstatic; this is exactly the kind of place that we’ll visit on a regular basis. In my opinion the small-but-local craft beer offering, on tap, the wine selection and the creative, on-trend cocktail list were just perfect. I ordered a The Old Jamaican, a rum cocktail, (Appleton, lime, mint, simple syrup, cava, bitters) to start. The menu was relatively small but covered all bases – I like seeing a small menu because I know the chance of consistency and proper execution can be much higher. As this was a soft opening I can’t say if the dishes will remain exactly as I experienced them – but to me they were done very well. I started with the halibut taco and to my surprise the fish was breaded and lightly deep-fried, with cabbage-apple salad, guacamole, and house-made taco sauce. Great, balanced flavours, nice crispiness and lots of crunch. Delicious. 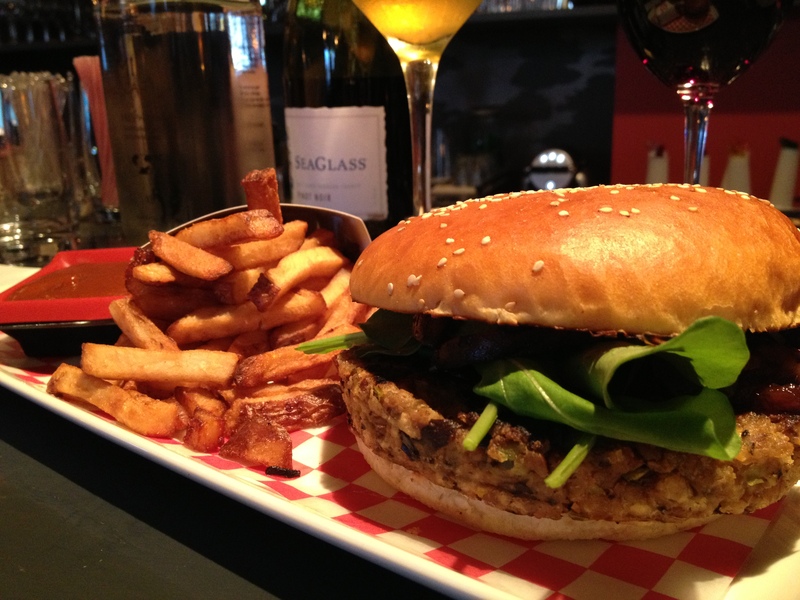 As a self-proclaimed veggie burger authority (and part-time vegetarian), I just had to order the “meaty meatless burger,” and weigh in with some feedback (which chef Flinn was very eager to hear). Loved the play on fast food with the presentation! It definitely was a conversation piece. Accompanied with house cut fries and ketchup from scratch was a very satisfying veggie burger. The bun was big and soft, the patty had a ton of flavour, and the grilled portobello mushrooms were a great addition for some non-meat meaty texture. It was the caramelized onion balsamic jam, though, that made the burger. It came across like some kind of heavenly, sticky, sweet barbecue sauce and really stepped this burger up a notch. I’d order it again. 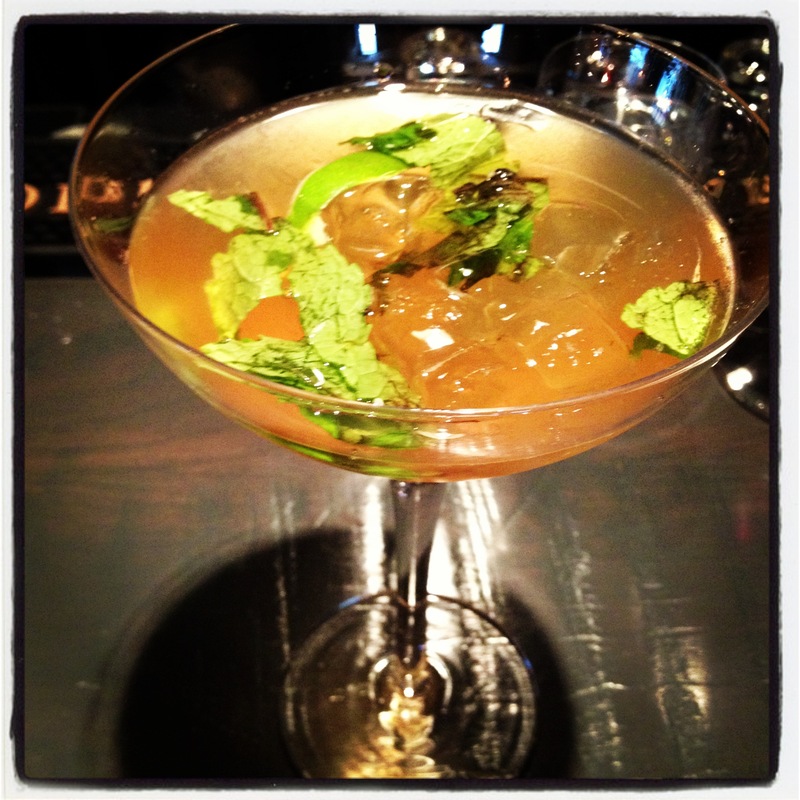 Having checked in on FourSquare, I was offered a house-made treat. 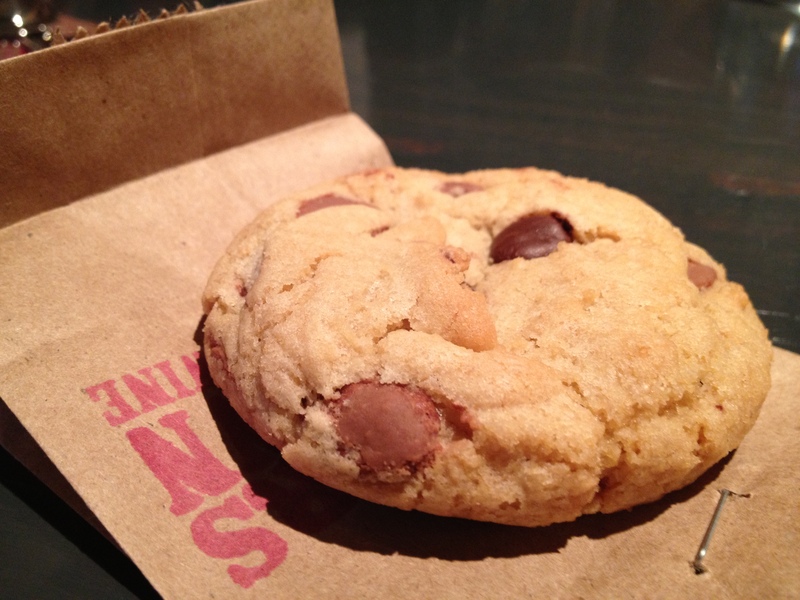 This was the kind of cookie that tastes like your grandma made it. Awesome touch. We’ll be back (many times I’m sure), and I know the food will just get better and better. Congrats to Craig and the team! 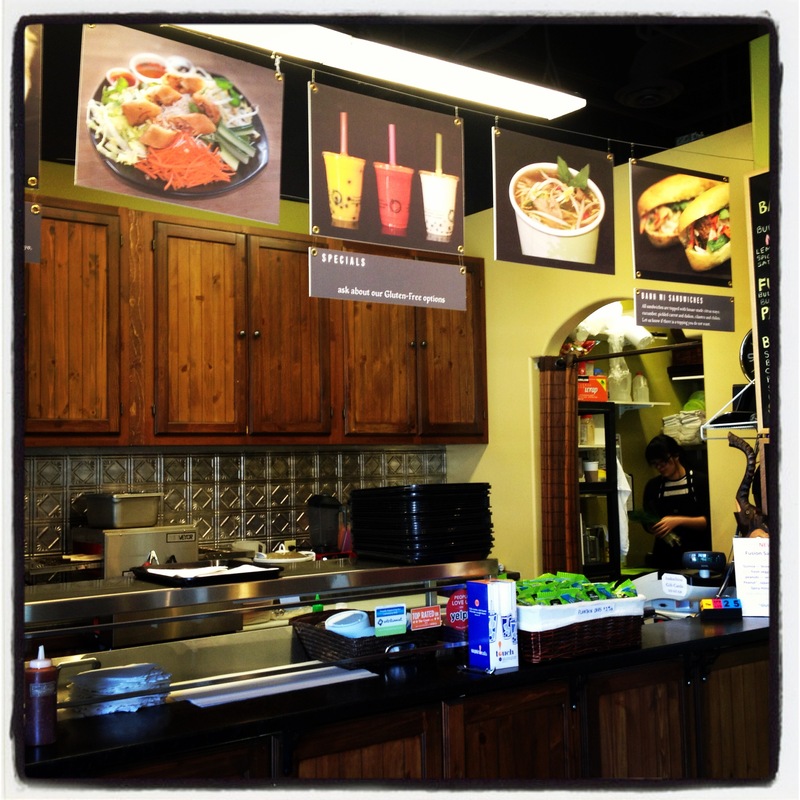 The counter at Indochine Bahn Mi. Yes, they have bubble tea. Fusion tacos. One might be prone to skepticism at such a term. Are they overdone? Tired? How could they be better than regular old Mexican tacos? Who eats fusion food anymore? 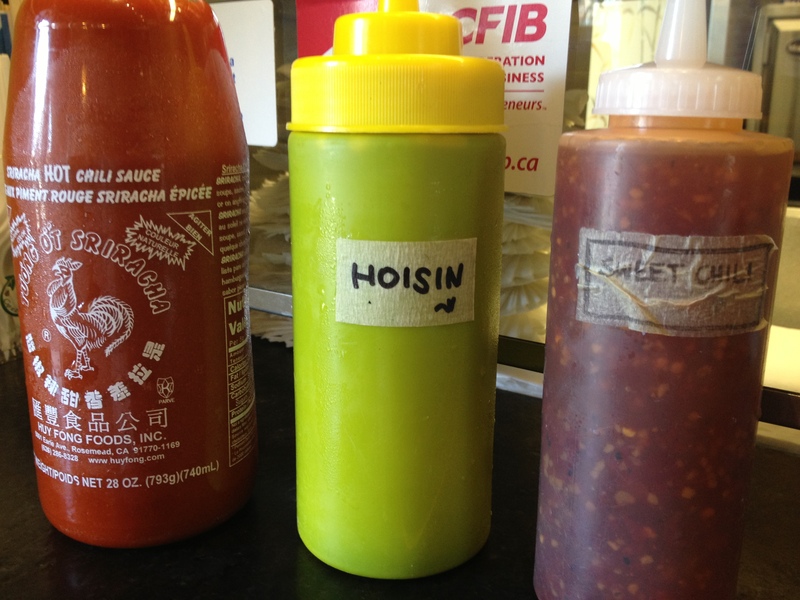 I eat fusion tacos at one of my favourite counter-style joints in Halifax, Indochine Bahn Mi. A no-frills experience with a massive amount of flavour, Indochine is the perfect environment for a messy, solo, eat-in fusion taco experience. 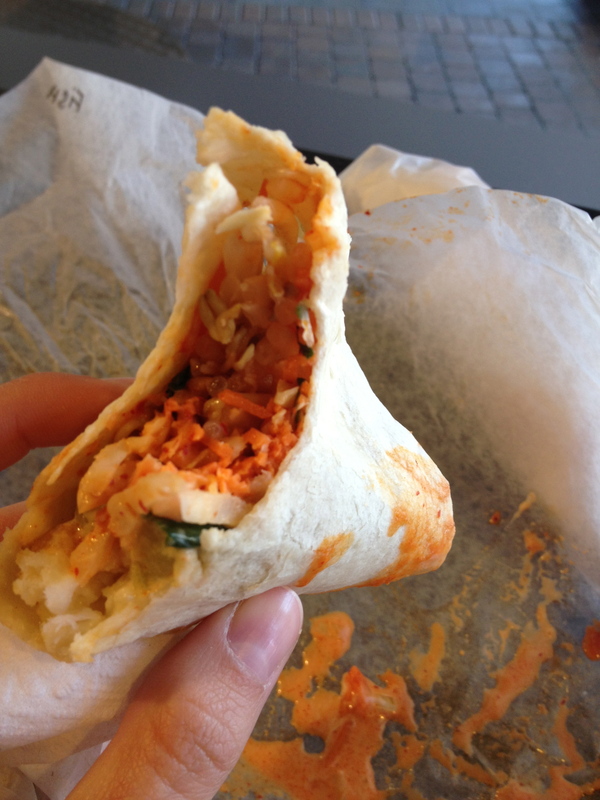 Order at the counter (get the two for $7.50 deal), and ask for what they call their Korean tacos. I’ve tried the haddock and the tofu. I went back for the tofu. Fusion fish taco. Worth the mess. Bulgogi-style marinated organic tofu (think soy, garlic, ginger and deliciousness) is done really well – it’s anything but bland – you can taste every marinade ingredient, and the texture retains some firmness. Along with tofu there is Indochine’s ‘spiced Asian slaw’ (fantastic, with fresh chiles), pickled daikon, cucumber, sprouts, and a sriracha-citrus mayo. The textural combination is delightful, as you can probably guess, with lots of crunch. The flavours just work so well (maybe because they’re delivered efficiently and cohesively to your mouth via the near-perfect eating vessel that is a taco), the sriracha-citrus mayo, for me, sends it over the top. It isn’t overly spicy so I add a bit more sriracha and settle in, with a large pile of napkins. The mess is worth it. I tried eating these while driving once. Don’t do that. 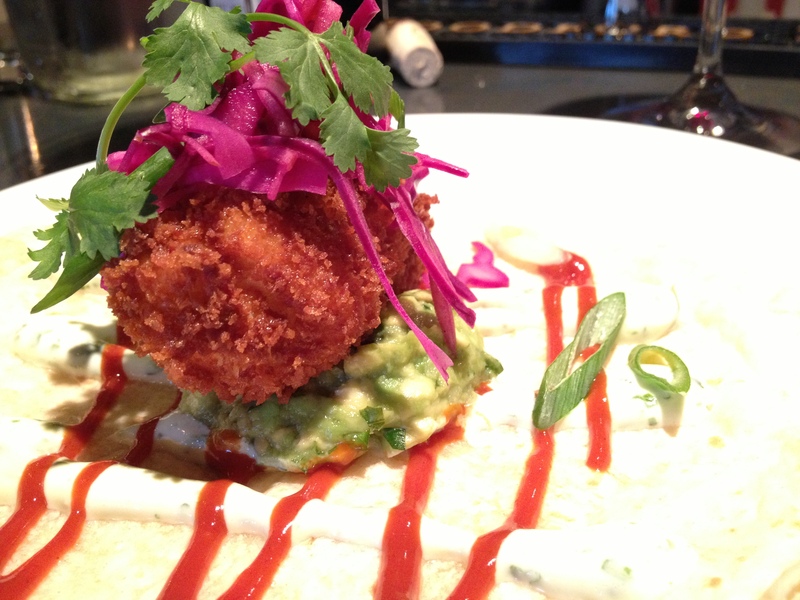 Just find a few moments to stop in and enjoy fusion tacos at their finest.